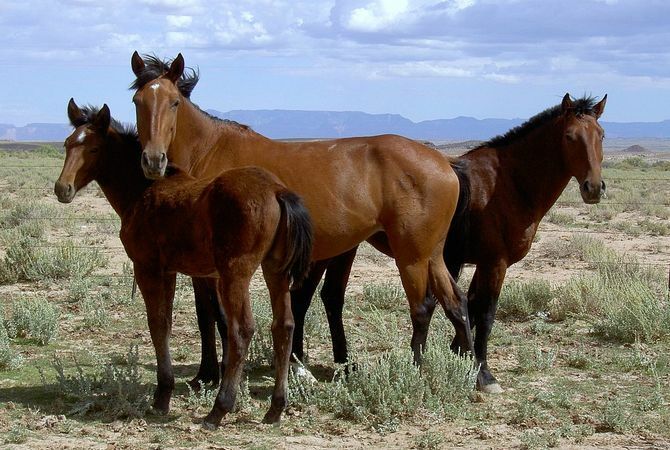 Since 2007, the Mustang Heritage Foundation (MHF) has placed more than 11,200 wild horses and burros into private care, and has now received recognition by the Bureau of Land Management (BLM). The recognition took place during a wild horse and burro event Nov. 2-3 at Meadowood Recreation Area in Lorton, Virginia. Since 2001, the MHF’s mission has been to create and promote programs and activities that elevate the image, trainability and placement of wild horses and burros, while educating the public about the program. “The Board of Trustees, myself and the staff of the Mustang Heritage Foundation are honored to receive this recognition from the Bureau of Land Management,” said Kali Sublett, Executive Director of the Mustang Heritage Foundation. “Over the past 12 years we have worked together tirelessly to ensure the success of the partnership and the programs it represents. One of the programs created and managed by the MHF is the Trainer Incentive Program (TIP) which was created to bridge the gap between potential adopters and American mustangs housed at BLM off-range corrals. The horse trainers in this program gentle and train wild mustangs ahttps://mustangheritagefoundation.org/tip/nd burros to make them more suitable for adoption or purchase. TIP trainers located all across the United States pick up animals from the BLM Wild Horse & Burro program and are paid a fee once the animals are adopted. For more information about the TIP program and how you can become a trainer of adopter visit https://mustangheritagefoundation.org/tip/. The MHF also offers different competitive events such as the Extreme Mustang Makeover and Mustang Magic. Trainers in these competitions have approximately 100 days to work with a wild mustang before they arrive to compete for cash and prizes. During the event, the trainers showcase the beauty, versatility and trainability of the American mustangs. The Veterans and Mustangs program is a life changing experience for both Veterans and their wild horses. Military veterans choose a BLM mustang, untouched by humans, and transform the horse in approximately six weeks into a gentled, adoptable equine companion. During the 6-week session, the veteran will experience the transformation from “wild to mild” by working directly with their chosen wild mustang, in addition to learning marketable equine vocational skills and general equine knowledge. At the end of the session, the previously wild horses that participate in the program are available for adoption by the veteran participant or placed into private care. This program is completely reliant on donations. To learn more about Veterans and Mustangs visit https://mustangheritagefoundation.org/veterans/. Another program of the MHF is the America’s Mustang educational campaign. The primary goal of this campaign is to educate the public about wild horses, where they reside, the conditions in which they live in, and the different ways the public can get involved. A 40 ft. interactive America’s Mustang Experience trailer, and soon, a mobile booth that travels across the United States to horse fairs, conventions, expos and events educating Americans about their wild horses. One of the exciting aspects about this trailer is the virtual reality headsets, where you can stand with wild mustangs on the range. For more information about America’s Mustang visit www.americasmustang.com.